Business Attitude: Fixing the Local Print Business – The LightsOn Solution – Part One - First Taste. Fixing the Local Print Business – The LightsOn Solution – Part One - First Taste. It is always easy to find critics and be critical, but is by far more difficult to have and execute a solution. When the critic works for you, you make the critic responsible for fixing the problem; it eliminates those who only criticize. When an individual is critical of a business situation (an opportunity) and tries to fix it we call them entrepreneurial. 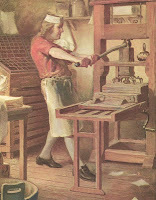 In the local print business, fragmentation has been the norm since before the days of Benjamin Franklin. The Internet has and is changing that as economies of scale are easily made online. It has equally changed the trade suppliers business as well who supply many products to the local printer. So why haven’t some of the local printers embraced the Internet opportunity? Some actually have, but none to the extent that Vistaprint did which from day one was about economies of scale and collecting and reselling that information they collect and service they provide. The economies of scale exist with the printed product, but not with the service. Eliminating the service slowly has and is causing the elimination of the local provider. The slow loss of revenue is causing for more and more printers to close shop; ultimately what we end up with is a lower quality product – without question – and eventually higher prices and fewer local jobs; both already taking place. This equates very much to the big box stores and Walmart’s entry to local markets. Compound this with McPrints and the squeeze on the local printer is almost always insurmountable. So what does the local printer need to do? We group the local postal services store in here as what they are doing seems to have more impact in fixing the problem than the local printer, in my opinion. They need to group together in a collaborative and cooperative way in both product and brand. The problem is that none of the individual franchise companies have the expertise, or primary interest, to work together; not much different than Ace Hardware does in a brick and mortar world – survival of the local hardware store has become as simple as becoming an Ace Hardware providing both collaborative advertising and coop style buying power. The trade association for quick printers, the NAQP (National Association of Quick Printers), whom merged with the NAPL about 6 years ago, should be pointing out this collaborative need but has the problem of shrinking membership – for obvious reason. So how does LightsOn solve this problem? In several ways, more than we are going to list here, but the gist will hopefully be understood. Once a prospect becomes a customer, that customer will always see the affiliate's information. Local price control by the affiliate. The ability for the affiliate to claim the customer, even after they have ordered. Pay very high commissions to the local affiliate/partner. The objective is not to move the local customer online, but to make the local prospect know there are local choices that provide more than the online only suppliers can. You may ask, why this is better than the local printer’s own website or one of the many branded websites that can be purchased from some of the trade suppliers. And then, so who is LightsOnGraphics.com’s customer and how does that happen? Too many unanswered questions here.!.! Remember, I am building the white paper and business plan – If you want to read ahead, read the affiliate brief at LightsOnGraphics.com. An entry that answers some questions that came after I posted this entry. More answers in my next piece – Stay Tuned.